We’d love your help. 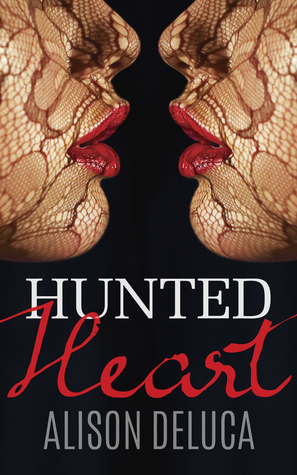 Let us know what’s wrong with this preview of Hunted Heart by Alison DeLuca. To ask other readers questions about Hunted Heart, please sign up. Happily, Hunted Heart by Alison DeLuca is a novel I can truly gush about. It’s a very adult twist on the classic Snow White. Having just written a twist on A Picture of Dorian Gray with my YA horror, Dorianna, I know how tricky it can be. The writer needs to echo the original tale enough to craft a genuine homage, yet in their new version, they should let it free-float organically out of the predecessor’s ghost to form an innovative story uniquely suited to the era and zeitgeist. DeLuca pulled i Happily, Hunted Heart by Alison DeLuca is a novel I can truly gush about. It’s a very adult twist on the classic Snow White. Having just written a twist on A Picture of Dorian Gray with my YA horror, Dorianna, I know how tricky it can be. The writer needs to echo the original tale enough to craft a genuine homage, yet in their new version, they should let it free-float organically out of the predecessor’s ghost to form an innovative story uniquely suited to the era and zeitgeist. DeLuca pulled it off! The rub: Queen Freja has lured Kas into her bed and drugged him, but Kas is not so receptive. In fact, he’s horrified once he snaps out of his drugged state to discover what’s happened. He is much more admiring of Tali, who can tell alluring stories as well as go on dangerous hunts. Meanwhile, Queen Freja has developed an obsessive crush on Kas, and when she realizes Tali and Kas have warmed up up to one another she orders Tali to complete a horrifying task: hunt Kas down, cut out his heart and bring it back to her as a trophy. I enjoy all things literary, and this gender-bent riff on the Snow-White tale is both literary and full of the fantastic. It is told in a style that harkens back to days gone by, to a time when prose was crafted for beauty as well as for the action it portrayed. When Tali is hired to cut out the heart of Prince Kas, the huntress can’t refuse. Tali realizes there is no escape from the dark magic of the queen’s mirror, even though her own feelings for the prince are far too com I enjoy all things literary, and this gender-bent riff on the Snow-White tale is both literary and full of the fantastic. It is told in a style that harkens back to days gone by, to a time when prose was crafted for beauty as well as for the action it portrayed. *Warning: Chapter 21 contains details about an attempted sexual assault. Also, several chapters detail an assault in the main character's background. Although there are no explicit details, readers sensitive to being triggered by references to sexual assault should exercise caution. Tali is an awesome character, strong and loyal, despite the terrible things that happened in her childhood. She is complex, and driven by her loyalty to her guardian. Prince Kas is no two-dimensional Disney prince either--he is multilayered and quite driven by human emotions. The setting and culture DeLuca places them in is baroque and mysterious. Their story is both harsh and intriguing, and is not sugar-coated in anyway. The style of writing in this tale is a bit more descriptive and ornate than I usually gravitate to, but I was intrigued by Tali and her situation enough that I soon got into the tale--she is forced down a path she doesn't want to take, and manipulated by one of the best portrayed evil protagonists I have read in a long time. Queen Leila is more nasty, more selfish, and more hateful than Voldemort in a dress. The story starts ominous with a girl hiding from an adult. Then we go into the fantasy which also had suspense, fears, hiding in books. There are so many characters that are full and drawn out. The huntress is a study of gender roles and everyone's else's reaction to her. There was so much I don't want to spoil, but it was a good story. The cover art was very well done and complex so that grabbed right away.